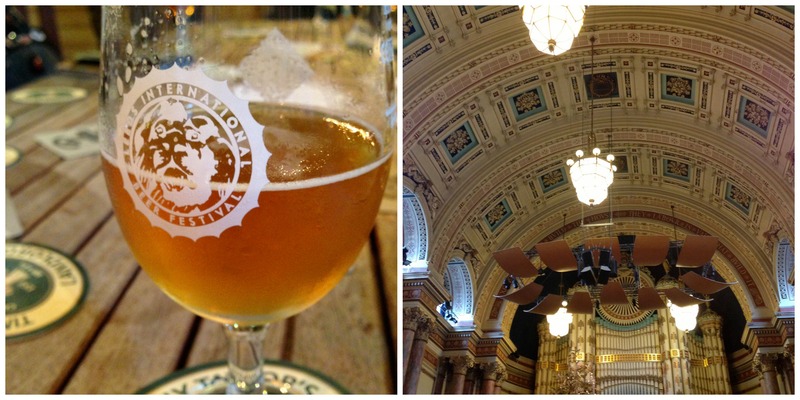 On Thursday, I went to the second Leeds International Beer Festival. Despite my utter lack of knowledge about beer, this isn’t the first beer festival I’ve been to. I’ve attended, and enjoyed, many a traditional CAMRA festival, despite being female and beardless, which seemed to put me distinctly in the minority. Leeds International Beer Festival is a different thing altogether though, and because of those differences, it’s the best one I’ve ever been to. Firstly, the location is a stunning one. Leeds Town Hall is an incredible building and a wonderful choice. Having it here makes the statement that it’s being taken very seriously as an addition to the calendar of events in Leeds and that can only be a good thing. Combining beer with some excellent street food and coffee from local companies was a brilliant idea, giving us a break from drinking to line our stomachs with tasty treats! Lovely beer and equally lovely ceiling! We had battered-three-ways fish and chips from Fish&, chickpea stew from Lafsaneh’s Kitchen and some freebies at the very end of the night from Bundobust who are soon to open in central Leeds. I’m really excited to see where and when this opens because it was gorgeous and I’ve yet to visit the renowned Prashad restaurant, who are collaborators in this venture. Everything we ate was really excellent quality and freshly made and I honestly could have tried something from every stall! Definitely an addition that should be made to all beer festivals in future. As well as food, there was also live music all night, which helped to create the vibrant and upbeat atmosphere. The collection of beers was an interesting one, with many contemporary-looking craft breweries and companies from the US and Europe as well as local names. My favourite drink from the evening was ‘Wu Gang Chops the Tree‘ from a small brewery called Pressure Drop. Described by them as a foraged herb hefeweisse, to me it had a light gingery and clove aftertaste which was incredibly palatable. And who doesn’t want to try a beer with that name? I also really enjoyed Lux Borealis from Hardknott brewery and some favourites from more local Yorkshire breweries, such as Ilkey Brewery’s Mary Jane and Kirkstall Brewery’s Framboise.